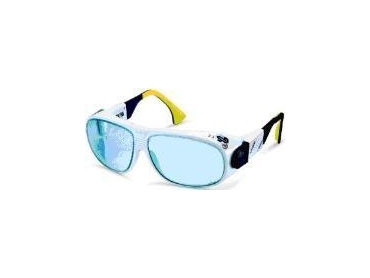 Laservision, partner of Laser Resources offers VISION (L-05) safety glasses. The VISION (L-05) is an ideal model for glass filters and coated plastic filters because it fits comfortably and can be individually adjusted. The flexible Duo-Flex side pieces can be adjusted in length and angle to eve­rybody's head shape and the soft ends prevent painful pressure on the ears, even after a long day. An important feature of this VISION (L-05) is the curved filters (basic curve 5), which provide a wide field of view and a sporty look. Due to the curved lenses, it is not suitable for all filters. It does not fit over correction glasses.